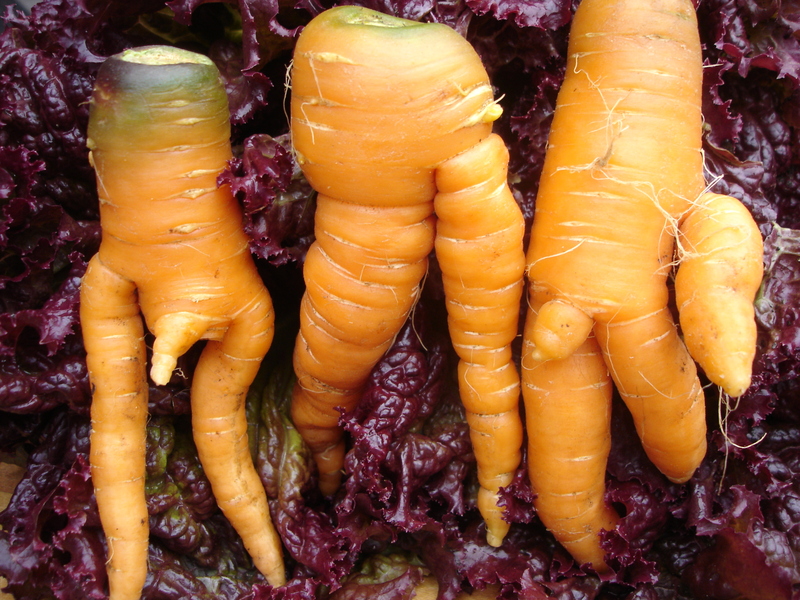 Carrots are nature’s long-legged root vixens. Just look at those lurid photos of wanton carrots on those “weird produce” sites (don’t pretend you haven’t seen them!). I’d welcome more carrots into my life but I’m surrounded by two camps of people. The “I hate cooked carrots” clan and the “I hate raw carrots” faction. Both are steadfast in their beliefs—they’ve been turned off by either bland carrot mush or woody bitter carrot sticks. What’s a carrot to do? Take a steam bath, whirl itself in a cloak of milk, sugar, and salt, anoint itself with a silky olive oil, and begin the seduction. I came across this carrot soup recipe on NHK’s Dining With The Chef, hosted by Rika Yukimasa, and one of my favorite cooking shows on television. I’ve name-checked Rika before in my Japanese Style Beef Stew, as she is my cooking spirit animal. Each episode features a simple Japanese-style dinner, and underscores the importance of soup in Japanese cuisine. Nearly every dinner begins with soup. 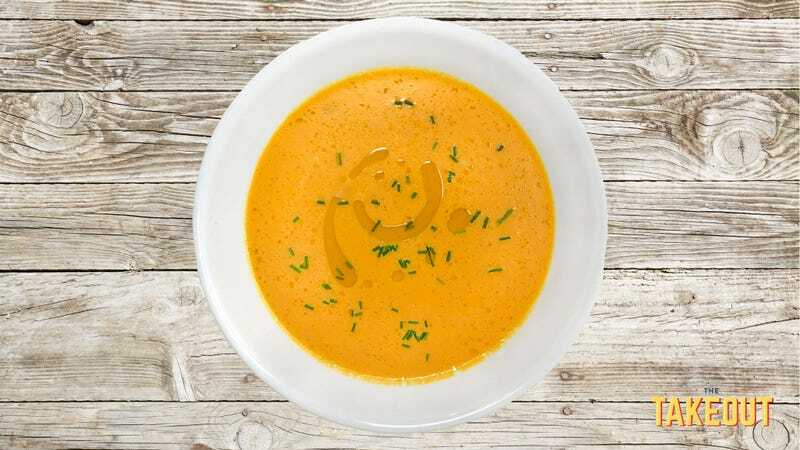 This carrot soup is at once both homey and elegant. The portions are small, just enough for two diners, but still satisfying. What’s most novel about this recipe—and it’s a life-changer for me—is how the carrots are cooked by being wrapped in plastic film and steamed in a microwave. Turns out, this is way faster than boiling in water, with the added benefit of not losing any nutrients into the cooking liquid. Microwaving plastic-wrapped carrots makes the vegetable easy to blend, and what emerges from your blender—combined with whole milk—is a mild, slightly sweet concoction with only the best-tasting carrot essences. It doesn’t hurt that it’s the swoony color of Dreamsicles. Since I have a tiny-but-mighty microwave, I ended up microwaving the carrot for less time than Rika indicates. Her suggested five-minute cooking time turned the bottom third of the carrot shriveled and leathery. I also reduced the salt a bit, from a half-teaspoon of coarse salt to a scant half-teaspoon—closer to a third of teaspoon. If you’d like it saltier, I’d recommend a tiny pinch of sea salt at the end rather than upping the quantity in the blender. This soup is perfect. It’s what I consider a genius recipe. But like a cackling old sorceress who can’t leave well enough alone, I shuffled to the pantry and begin flinging bits of seasoning into small beakers of carrot soup. Minced chives went into one sample for a perky oniony zip. Smoked paprika and lemon into another for a hint of the sunny Spanish coast. Curry powder and coconut milk into another for a tingly, creamy sensation. A pinch of earthy cumin to evoke the smoldering squint of Gael García Bernal into another (are we still talking about soup?). I stopped adding things when I stopped making sense. All additions are good, but completely unnecessary. The point of this recipe is to the taste the carrot. Feel the carrot. Be the carrot. Make it just as it is, and see for yourself. Make this once, and you’ll make it forever. Peel the carrot and remove the tip and stem end. Cut carrot in half and lay pieces side by side. Wrap in plastic wrap (use a microwave-safe, BPA-free wrap, such as Saran). Microwave for one and a half minutes, then flip over carefully and microwave for another minute. Depending on your microwave, the carrot should be smoothly soft to the touch, but not disintegrating. Unwrap the carrot carefully (! ), and dice into half-inch pieces. Add to a blender (we use the Magic Bullet) with milk, sugar, and salt. Blend until smooth. Pour into small glass or white bowls to show off that luminous orange color. Drizzle with olive oil, and if desired, a pinch of salt. Slurp!